Remember kids, brush after every meal, when you wake up, before bed, and before your next extended make-out session! And New Crust Stripy Mint is the best paste you can use! 4 out of 500 dentists agree! Now in Grilled Pineapple and Onion flavor! Ok. That flavor combination for toothpaste is wrong. In fact, it's wrong for any combination. Unless you serve it on pumpernickel bread with a slice of provolone cheese. No, on second thoughts, that would be disgusting. But then, I'm not a fan of pumpernickel, or pineapple. Or raw onion. I like provolone cheese, though. Especially on a meatball sammich! But, no one wants to hear about provolone cheese. They want to hear an oddity. So here goes. That picture is a closeup of an iceberg. "But", your'e saying, "Icebergs are made of water, and that means they should be one color!" And, when you freeze your tap water into ice cubes, you'd be right. But icebergs aren't like ice as you know it. Icebergs float around in the oceans, which are made of salt water. And salt water is.....salty. But, and here's the catch, icebergs aren't made from salt water. They're fresh water. As the snow builds up and forms ice, it gets deeper and deeper. Gravity will cause it to move down, which is usually in the direction of the coast. There, these giant ice shelves will break off and fall into the sea. That's an iceberg. But, sometimes, it gets warm. When that happens, the white ice melts back into water. If it refreezes rapidly, it will freeze blue because air doesn't have a chance to form the bubbles needed to make it white. This melt water generally refreezes in an existing crack in the ice, and as such, causes stripes on the iceberg. However, blue isn't the only color stripe you'll find on icebergs. You will also find green, brown, black and grey. The green stripes are caused after the iceberg falls into the sea. Algae will attach to the ice and basically dye the ice green. The brown, black and grey are caused when the ice travels across the land towards the sea and picks up layers of dirt or other sediments. The stripes on icebergs will run in all different directions when floating. That has to do with the center of gravity causing the berg to spin in the water. 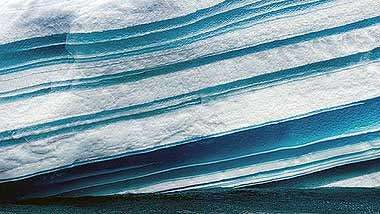 It's unusual to see a striped iceberg, as all we ever see in pictures are the white ones. But the striped ones are quite beautiful. So beautiful, in fact, I'm going to include more, better pictures of them for your pleasure.